Also: A volunteer's perspective on Dreams to Success, Affiliate Award deadline, and common awarding/disbursing scenarios. On May 22, Scholarship America’s National Dreams to Success Dinner & Awards Celebration was held as both an annual celebration of higher education support programs and an opportunity for the most passionate supporters of education to gather as a community and raise dollars needed to provide scholarships for students who seek dreams of a higher education. In 2018, we made Dreams to Success bigger and better with an entire day devoted to the best in higher education, scholarship and student support. 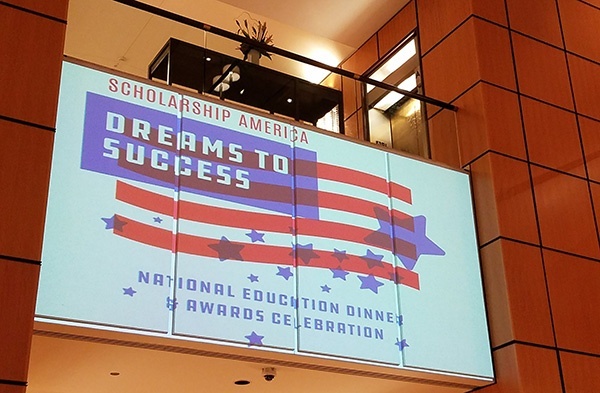 Scholarship America’s Dreams to Success Day included a first-ever Partner Summit in addition to the Student Success Day and Dreams to Success National Dinner & Awards Celebration. Check out the highlights and speakers. Dollars for Scholars' 2017 Affiliate Award winners were invited to participate. Susan Quinlan, Vice President of Excel Beyond 211 Dollars for Scholars, shares her experiences from the event with us. Four years ago, a small group of retired educators organized with a dream of mentoring First Generation college students. Little did we know that Scholarship America would help us fulfill our dream. Today, as the proud chapter, Excel Beyond 211 Dollars* for Scholars, not only are we watching our first mentees graduate from college but we have been honored as the recipient of the Scholarship America Innovation Award. This message reinforced our mission that a system of support is necessary to get through college. For students today, the mantra that Cash Rules Everything Around Me (CREAM), supports our message to donors that emergency aid is key to helping students succeed.We were invited to attend the Dreams for Success Conference and Reception, and the trip to Washington, D.C. was truly inspiring. The Scholarship America Partner Summit reinforced our belief that as higher education changes and the cost continues to climb, students need a broader range of support. In beginning remarks, Bob Ballard, President/CEO of Scholarship America, encouraged us to share information, embrace our compassion to help all students achieve an education, and leave with a new idea. Everything we heard from an impressive group of speakers reinforced that the new economics of college: prices are higher than ever, family incomes remain stagnant, the safety net is shredded and colleges are underfunded. Although we were filled with many new ideas, the Partner Summit was topped by the Dreams to Success Dinner and Awards Ceremony. We were seated with the family of Dr. Irving Fradkin, founder of “Dollars for Scholars,” that has expanded into the nation’s largest nonprofit, private sector scholarship and educational support organization—Scholarship America. Remarkably, we then watched in awe the recognition of George J. Mitchell, United States Senator, Maine – 1980-1995, and founder of The Mitchell Institute that has awarded more than $14,500,000 in scholarships. The Dream Award scholars were also honored and congratulated for their perseverance and commitment to their education. 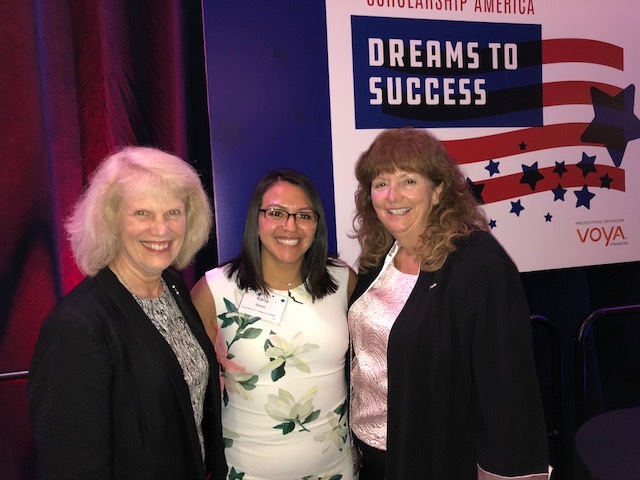 We are so grateful to Scholarship America for inviting Karla, our own mentee and scholarship dreamer, to the celebration activities. Karla is in Washington, D.C. on an internship and her invitation reinforces the belief that Scholarship America is committed to helping all students achieve the Dream of College and the Reality of Success. Thank you Scholarship America! It is an honor to be a part of the dream. *Donna Epton, the 2017 National Volunteer of the Year was also from Excel Beyond 211 Dollars for Scholars. 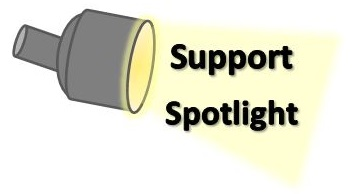 Nominate Your Dollars for Scholars Affiliate Today! There’s still time to nominate your affiliate or affiliate volunteer for the Affiliate of the Year Award, Innovation Award, and Volunteer of the Year Award, but the June 30th deadline is quickly approaching. Winners receive a $1,000 scholarship to award to one of your deserving students. The awards committee will select category winners from each of the three groups of Dollars for Scholars affiliates – small, intermediate, and large. In addition to the $1,000 prize awarded in each group, a national winner will be selected in each category to receive another $2,000 for their scholarship program. If you have questions please contact your Director, Community Engagement & Partnerships. Nominate your affiliate today; the deadline is June 30, 2018! Awards were made, but something's changed. Now what? Most of our affiliates have already selected their scholarship recipients, held their award ceremonies, and are now preparing to disburse scholarship funds. Inevitably, something will change between the time the scholarship is awarded and when the funds are to be disbursed -- scholarship recipients may have changed their minds about which school to attend, when to attend, if they will be attending at all, or you may have received additional donations and now need to increase the amount of an award. These types of changes may require you to update what has already been recorded in ChapterNet. Below are some common scenarios and the steps to take to record these changes. If additional donations come in after scholarships have been awarded in ChapterNet, award amounts can be increased, but the steps vary depending on how far you are in the awarding process. Use the "Change Award Amount" button on the Applicants tab of the scholarship to increase the award amount. An email will be sent to the student notifying them of the amount change and asking them to log in and re-accept. The recipient can update the College you are currently attending field in the Schools section of their profile. Note: The college entered in the Scholarship Acknowledgement Form will not change. If the recipient does not update this information in their profile, the correct school can be selected when a disbursement is entered. If a recipient decides to delay going to college, your affiliate will want to refer to its Scholarship Awards Policy to see if deferments are allowed. If deferments are not allowed, you can choose to unaward this scholarship and award it to a different student, or save the funds for the following year and record a "Canceled" disbursement for this recipient. Outline in the "Notes" field how long the scholarship can be deferred for and the claim process. And if you encounter an awarding or disbursing scenario not outlined above, please contact our support team so we can assist you in recording these changes. You received this email because you are subscribed to Dollars for Scholars News from Scholarship America. If you are Student, you can update your email preferences to select what types of emails you'd like to receive, or Unsubscribe from all future emails from Scholarship America and Dollars for Scholars. If you received this email as a forward and you'd like to subscribe, you can do so here.